A geneticist, a philosopher and a chicken farmer say they have found the answer to a great evolutionary puzzle. The experts looked at the evidence in the long-standing debate over which came first - the chicken or the egg - and opted for the egg. Professor John Brookfield, a genetics expert from Nottingham University, said the first chicken must have started out as an embryo in an egg. This means the organism in the eggshell would have the same DNA as the chicken. He explained that the reason was due to the fact that genetic material does not change during an animal's life. Professor Brookfield said: "The first living thing which we could say unequivocally was a member of the species would be this first egg, so I would conclude that the egg came first." 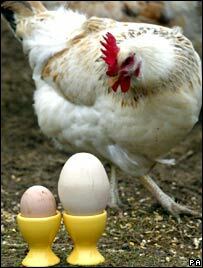 Professor David Papineau, an expert in the philosophy of science at King's College, London agreed that the first chicken came from an egg and this proves there were chicken eggs before chickens. "I would argue it is a chicken egg if it has a chicken in it," said Prof Papineau. "If a kangaroo laid an egg from which an ostrich hatched, that would surely be an ostrich egg, not a kangaroo egg," he added. Charles Bournes, chairman of trade body Great British Chicken, said "Eggs were around long before the first chicken arrived. "Of course they may not have been chicken eggs as we see them today but they were eggs," he said. Professor Brooke added the debate could finally be laid to rest.